Christmas Traditions - are they worth your time? ​See, my landlord had grown up in the house where we were living, and I loved to hear sentimental stories like that one. I quickly asked my landlord right then and there if I could could use the star that Christmas and was glad when he consented. I strung the star with fresh white lights and, not daring enough to venture to the roof, propped it up right next to our front door. At night it had a beautiful effect. And since our home was up on a hill a short distance from a busy road, I hoped that it reminded passersby of the Star of Bethlehem. I was surprised a year or two later though when my son came home from school with a paper he had written on family traditions. My star made the top of his list! I had no idea I had created a tradition for my own family. And you better believe I put it up again that Christmas. But sometimes, when the holidays roll around, I get to thinking about how much work I’ll save by eliminating this or that tradition. I mean, what if we didn’t even do a tree this year? No needles, no tangled lights, none of those crazy hooks stuck in the carpet. Our family has actually gone into a “simple mode” the past few years with a small artificial tree– but maybe we didn’t need to get that out either. In his piece, “Father of the Memory,” Ivy highlights how important family traditions are to our kids saying: “Traditions are part of life. They set standards of behavior. They impart family values. They help knit together family members into a tapestry that gives each one a sense of belonging and acceptance. I liked what Ivy had to say and somehow it all made sense to me again. Traditions may take work, but they do have purpose. And one of the nice things about them is that while you can keep old ones alive, you can always add new ones to the mix like my star. One year I received a 12-piece ceramic nativity set from a friend and with it, we added a new family tradition. Twelve days before Christmas, one family member sets out the first nativity figure and each one is taken out a day after that until Christmas. And on Christmas morning, the baby Jesus takes the place of honor between Mary and Joseph. This has been a great reminder for many years but last year, well, I dropped the ball. Things were busy and most of the figures in the nativity set never even made their way out of the box. But, on Christmas morning, my husband and I came up with an idea. Setting out the box of wrapped figures, we let each our children set up a figure and tell us how they’ve grown in Christ that year and how they’d like to grow in Christ the next. Hearing what my kids had to say was the most touching part of the whole day for me. 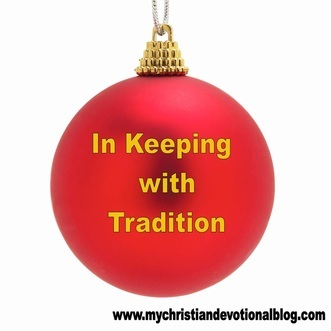 Traditions do take time and sometimes work, but they are important part of the makeup of our families. Keeping them alive can be one of the gifts you give your kids or grandkids this year. Pattern yourselves after me [follow my example], as I imitate and follow Christ (the Messiah). I appreciate and commend you because you always remember me in everything and keep firm possession of the traditions (the substance of my instructions), just as I have [verbally] passed them on to you. So then, brethren, stand firm and hold fast to the traditions and instructions which you were taught by us, whether by our word of mouth or by letter.